Last month while staying at our friend's pad, we were introduced to the wonderful and out of this world works of one Joseph. 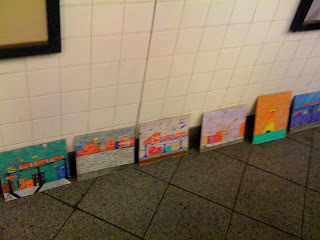 His drawings all consist of the same centralized theme "space invaders attack NYC." There is small buzz amongst friends here about his works and how to obtain an original. 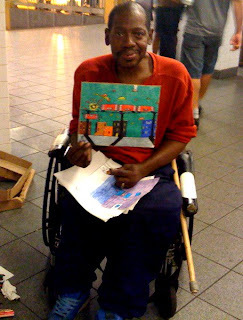 Well yesterday at 8th ave/L train, we stumbled upon Joseph the original! Here he is pictured with the piece we purchased for $15. Next time when we're not in such a rush as we were yesterday, we need to find out more about this man. Has Joseph seen any UFOs lately?